This paper analyses some of the main factors behind the recent rapid growth in the Commonwealth of Independent States (CIS) and the prospects for its continuation. Two approaches are used. The first approach uses growth accounting exercises to estimate the total factor productivity (TFP) growth of all transition economies and compare them with other fast-growing economies. The second approach uses panel regression to estimate the determinants of per capita and TFP growth for 90 countries. Both short-run and long run coefficients are estimated using fixed effects, random effects, and two stage least squares (2SLS) econometric techniques. 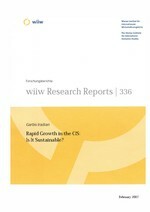 The central conclusion of the study is that the rapid growth of the CIS countries over the past six years has been driven primarily by improvement in labour productivity, increases in capacity utilization, recovery of previously lost output, favourable commodity prices, and large increases in remittances. This strong growth may continue over the next few years. Why? First, the still relatively low real GDP base and low average per capita means that there is more catch-up potential. Second, the recent trend of faster capital accumulation is expected to play a more important role in the medium-term growth. Third, education levels are relatively much higher than in other regions. There is a downside risk, however, arising from the high concentration of exports in a few commodities. The undiversified export structure and the terms-of-trade gains may expose the CIS countries to considerable external risks. The challenge, therefore, will be to improve the investment climate in the non-primary sectors. Improving the investment climate will require further progress in implementing structural reform and strengthening institutional development. The undiversified export structure and the terms-of-trade gains may expose the CIS countries to considerable external risks. As time passes, the share of growth derived from improved resource allocation may diminish gradually and long-term rapid growth will be increasingly dependent on physical and human capital accumulation.